Setting up yet another first in the broadcasting industry in India, Dishtv, India’s largest direct-to-home company is all set to redefine the Indian television industry by announcing the launch of 30 individual channels in High Definition. With as many as 30 channels offered in high definition, the Indian TV viewership is primed to reach the next level of digital entertainment. Dishtv now has an enhanced product portfolio of 267 channels in standard definition and 30 channels in high definition, which is substantially higher than any competing DTH operator in both HD as well as SD transmission. Dishtv will offer all cricket fans the highly anticipated ICC World cup 2011 on high definition, which offers viewers a near- stadium experience. Other than the World Cup feed, the channels which Dish truHD offers include Zee TV, Zee Cinema, Zee News, Zee Studio, Zee Café, HBO, Movies Now, Discovery, National Geographic, Animal Planet, Zee Talkies, Zee Bangla, Zee Telugu, Zee Kannada, Times Now, ET Now, Cartoon Network, POGO, Ten Sports, AXN, MTV, VH1, WB, Pix, TLC, Ten Cricket, UTV Action, UTV Movies, Sony, Colors. With the Indian broadcasting system going in for a sea change, the Indian consumers are showing a very positive acceptance towards HD enabled systems and the availability of Full HD content through the DTH platform. Though many of the DTH players in the industry have launched the high definition format, most of them do not have more than 3-5 HD channels to offer to their subscribers. 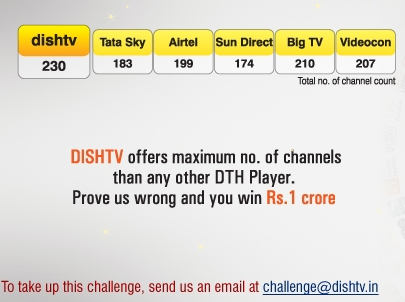 As a front runner in the DTH sector, Dishtv will offer 30 HD channels on its HD format. Dish truHD will be offered at a price of Rs. 2390 which will include one month’s Platinum subscription and all 30 HD Channels. Alternatively, Dish truHD packs will be available in two variants- Base pack of 15 channels @ Rs 125/- per month and A-La Carte of 15 channels @ Rs 100/- per month. Dish truHD will also showcase the World Cup and the French Open through a special pack @ Rs 150/- for the both the tournaments. Press Releases Submitted to Trak.in. CBSE to award Higher grades to Students for all-round Development!! Social Media ROI – Can you measure it fully? There are many pluses for dish tv, but their customer service is terrible. Today my STB software got auto upgraded, and I have to hack around my way through it. I can’t access my favourite channels without digging through the huge channel list. There is no manual or instruction on their website either. These people keep annonying you with repeated SMS (some at odd hours) asking you to buy a second connection, but will not inform you about an impending STB software upgrade. So when it comes, it is like a cloud burst from above. I hope they put a new instruction manual for this software (which is hard on the eyes) on their website. Most of the mentioned HD channels are in SD format. No difference in channels mentioned HD and normal channel ( For Eg ZEE and ZEE HD could not make out any difference between the same.) Only FULL HD was applicable to Discovery HD/NAT GEO HD/movies now /& Star cricket HD.